If you're looking for a decent, relatively affordable speaker that you can throw in your bag, take to the beach, in your bathroom, or wherever, the Flip 4 is convenient. The market is full of Bluetooth speakers, that's no secret. As with any saturated market various manufacturers clamber over one another to try and get the best combination of features into the most attractive possible package. For portable speakers that means waterproofing, loud audio, bass, and linking up with multiple speakers. The JBL Flip 4 offers all of those things, in a speaker that's slim enough to fit in a cupholder. With its well-established brand name, can JBL entice consumers away from the Ultimate Ears, Denon, Sony and other alternatives out there? As with most current portable speakers, the Flip 4 is approximately cylindrical by design. Most of the exterior is covered in a weaved nylon fabric, with the rectangle JBL logo plate sitting in a central position on the front. It's worth noting, despite its round design, this is definitely the front. The two built-in speakers face outwards from this way, while the "back" is a plastic strip that acts as both a stand (more a ridge that stops it from rolling), and a home for the ports and buttons. It's on this control panel where you'll find the flap covering the Micro-USB port used for charging, and the 3.5mm jack if you want to wire a player in. This flap is a little difficult to open - which is reassuring, when you're using in a wet environment. You know water isn't going to find its way into those ports. On the flipside, it's a little frustrating when you need to charge the battery. This plastic panel on the back is also home to the the power button and the Connect+ button for pairing the Flip 4 with other products. Four other buttons - the usual play/pause, volume up, volume down and Bluetooth pairing buttons - are much larger, raised, and easy to feel them out without looking. Each of the two ends of the cylinder house a passive bass radiator. With the music playing loud enough, it's quite fun to watch these move around and vibrate. The design of these two ends is further indication that there really is a true "front" of the speaker: if you stand it up on one of the ends, it leans backwards slightly, angling the speakers a few degrees upwards so the audio isn't just firing straight out and parallel with the floor. For those planning on using the speaker outdoors, the most important design feature is its waterproof rating. An IPX7 rating means it can be submerged in up to one metre of water, for up to thirty minutes. So, take it outside, to the pool, beach, in the rain, and it'll still keep working (providing you keep that flap on the back properly closed). Size-wise, thanks to roughly being the width of a soft drink bottle, it's comfortably capable of fitting in the side pockets of a rucksack, or held in hand. It's even equipped with a cord, so you can hang it from pretty much anything, or use it for carrying the speaker around with you. One of the most intriguing features of the Flip 4 is the Connect+ pairing - which allows it to connect to other JBL Flip audio products, producing multi-speaker sound, which should help when listening in larger rooms or big open spaces. It's similar to features we've seen from the likes of the Bose Soundlink Revolve and Beats Pill+. Sadly we weren't able to test this to see how well it worked in real life. The 3,000mAh battery inside is claimed to support up to 12 hours of constant music playing. This, as usual, depends on how loud the music is played, and what kind of music it is to some degree. In our use, it comfortably made it to between 10-11 hours before the battery level indicator suggested it was approaching game over. General performance is good. So long as the connected device is in the same room as the speaker, the Bluetooth connection remains solid and, in our testing, never dropped out. Only when we moved the music source into the next room, say more than 10 metres away, did the audio start to drop out and be inconsistent. While all the majority of its features can be enjoyed without a smartphone app, there is the JBL Connect app that can be downloaded for Android or iPhone. This allows you to choose whether you want the "play" button to play/pause music or launch your phone's default voice assistant. Whether that be Google Assistant or Siri. You can also use the app to manage how the speaker connects with other speakers; this could be either with one other speaker in stereo mode or connecting to multiple speakers in "party mode". Considering its relatively compact size, the Flip 4 delivers an impressive amount of bass. It might not have the ultra-low frequency response of some much more expensive speakers or headphones (which typically are rated at 20Hz minimum, far lower than JBL's 70Hz claim), but it still manages to pump out enough of the lower frequencies to fill a small room. In larger rooms, it's fine, but you do find the audio can get a little lost if you have an open-plan area, or high ceilings, as you would find with any small speaker. Pump the volume all the way up, and you'll find the treble/high-frequencies are too harsh, while bass loses its effectiveness at such volume; the low-end also vanishes a bit when you turn the speaker down too low, too, so you definitely have to find a volume sweetspot somewhere in the middle for the most balanced sound results. At optimum volume, the Flip 4's overall quality is pleasant, delivering the right balance, with that generous bass filling out the rest of the sound with warmth. Details are pretty good to for a small, affordable speaker. There's no noticeable distortion and enough clarity to make the listening experience enjoyable. If you're looking for a decent and relatively affordable speaker that you can throw in your bag, take to the beach, or wherever, then the JBL Flip 4 is a convenient solution. At the right volume it delivers decent sound that can fill small/medium size rooms without much hassle. It'll survive anything you throw at it and the on-board battery will survive a whole day. We feel it would be nice to have a quick pairing option via NFC for Android phones, and an equaliser built into the app to make the sound a little more customisable. What's more, because the speakers only fire one way, that means those who might be behind it don't enjoy anything close to the optimal sound offered by the speaker. For a portable speaker these days, 360-degree audio should be standard, which is what Ultimate Ears has been offering for years now. 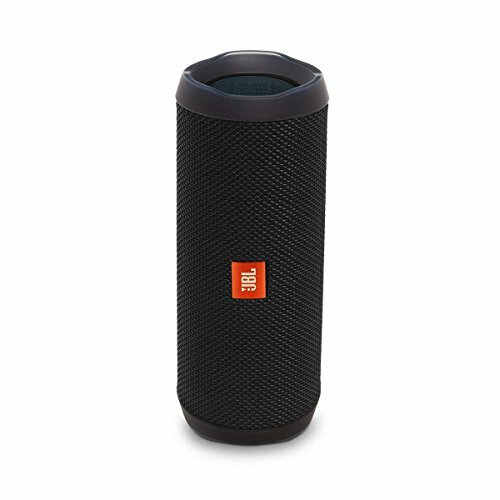 Despite that, the JBL Flip is a great combination of versatility, portability and convenience all wrapped into an attractive package. Its main issue is the strong competition, of which there is a whole lot. "XB" stands for "Extra Bass" - which is what Sony's semi-portable is all about. It's far larger than the Flip 4, but the bass is bigger and bolder. UE is now well-established in the fun portable Bluetooth speaker space - and might well make the best one of the lot. It's also more affordable than the JBL, offers the same feature set, and if you look hard enough can be picked up for less cash too. The premier league of audio brands includes Bose. Its small, portable Bluetooth speaker might be pricier than the JBL, but it delivers classier sound over all, in our view.